In order to use an FM1100 for remote or repeater operation it needs a squelch-open signal output. 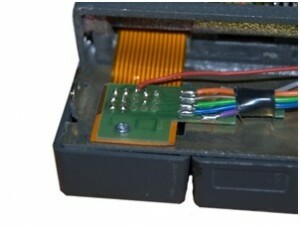 This document shows how it can be brought out of Pin13 on the front panel connector. The benefit of using Pin13 is that it is populated on most microphone cables so does not require a special plug. 1) Remove the front panel from the radio. Remove the display section from the backplate. Remove the diecast section from the plastic cover. Unscrew the circuit board from the diecast backplate. Unscrew/remove the plastic LED cover. 6) Solder the other end of the new wire to pin 13 of the microphone connector. 7) Cut the On-hook track on the analog board. 8) Refit all the remaining covers. Download the complete document as a PDF.